Mac desktops and laptops are premium computers from Apple, frequently used for both business and leisure. At Woodstock IT our team are highly skilled in the service and repair of all makes and models of Apple desktops and laptops. For your convenience, we can carry out on site fixes at your work or home, or run through tests and diagnoses at our Horsham drop in clinic. We aim to deliver quality results in a timely fashion as we understand how integral Macs can be to everyday life. If your Mac is running slow, has hardware damage or you’re experiencing other system issues, call us on 01403 290 321 or 01293 912 321 for advice and fixes. We work throughout Sussex and Surrey in Horsham, Crawley, Guildford, Worthing and everywhere in between. We can help with all existing Apple operating systems and desktop and laptop machines, including iMac, MacBook, MacBook Pro and iMac Mini. 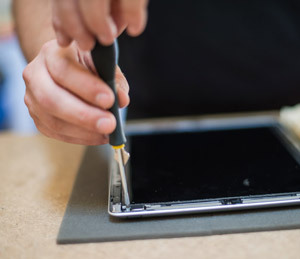 Please note we do not service or repair iPhones or iPads. Depending on the age and condition of your Mac, we may recommend that you upgrade to a newer model complete with up to date software and support for operating systems. We would determine this through assessing the viability of your machine to carry out the tasks required of it on a daily basis. If you’re unsure whether your Mac has reached it’s limits and don’t want to risk a complete failure or loss of files, talk to us first. Whilst we carry out repairs on your Mac we can provide you with a replacement machine so you can continue to access the internet, complete work, and communicate online without disruption. We endeavour to provide the best replacement possible that’s of equivalent power for the short time your computer is with us. We charge for our work at a standard hourly rate which will be quoted to you before we begin and you won’t be obligated to accept. All our services are cost effective and efficient and we operate a ‘no jargon’ approach as we keep you updated on progress.